A Niagara Regional Police Service constable was shot by a fellow officer early Thursday afternoon during an “altercation” in North Pelham, according to Special Investigations Unit spokesperson Monica Hudon, addressing the news media on Thursday evening. Hudon spoke near the scene of the shooting, which took place shortly after 12 noon near the intersection of Effingham Street and Roland Road in North Pelham. The Hamilton Spectator reports that Det. Sgt. Shane Donovan fired as many as five shots, hitting Const. Nathan Parker. Unconfirmed witness reports coming into the Voice have Parker wearing a regulation bulletproof vest, and being hit in the leg, chest, and face. Aside from Hudon’s reference to an altercation, there is no known motive for the shooting. Donovan has not been taken into custody. Parker remains in critical condition, said Hudon, after being airlifted to Hamilton for treatment. The Spectator reports that Parker, 52, has a “long and troubled history” with the police service, facing some four disciplinary hearings, three of which involved allegations of violence, dating back to 2005, when he pepper sprayed a restrained and handcuffed prisoner seated in the back of a patrol car. The officers were on scene Thursday morning as part of an accident reconstruction effort relating to an alleged impaired driving incident that occurred on November 12, when a 19-year-old Pelham man lost control of his car on a curve, hitting a tree. Two female passengers, trapped for a time in the burning vehicle, were rescued by nearby residents and Pelham firefighters. 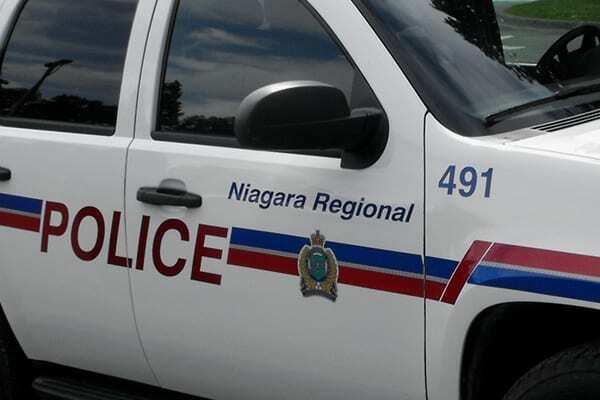 Donovan, the alleged shooter, is well known to Niagara media organizations as the name behind news releases pertaining to NRP traffic enforcement efforts. In a statement released after the SIU’s Hudon spoke near the shooting scene, NRP Chief Bryan MacCulloch said that the investigation was in the hands of the Special Investigations Unit. “In the spirit of transparency, I have asked the Ontario Provincial Police to determine if there is any criminal culpability outside of the SIUs scope,” said MacCulloch. UPDATE: The SIU Tweeted later Thursday evening that Nathan Parker’s age was 52, not 44 as spokesperson Monica Hudon earlier stated.